If you guys are like me, getting a passenger for a grooming trip is a treat. It doesn’t happen very often so when somebody asks if they can come along we tend to underestimate how long the trip is. “Oh, it’s only a 4 hour run, time flies in a groomer!” It always ends up being way longer than what you told them. Your guest ends up falling asleep, curled up in a little ball in the passenger seat, drool coming out of the corner of their mouth and every so often you hear their head banging in the side window because of the bums and jerking of the machine. Once the trip is done you never see them again and they tell others not to go. The Groomer slipping of the trail is a common thing. 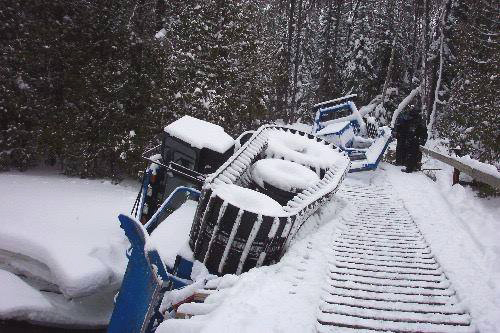 The operator was probably trying to make the trail wider than they were supposed to or their reflexes were slowing as they got tired. It’s never that bad. Or at least that’s what you’re told on the phone when you get the “I need help” call. You rally up a posse and ride out to the scene only to find that the groomer is off the trail in deep snow. 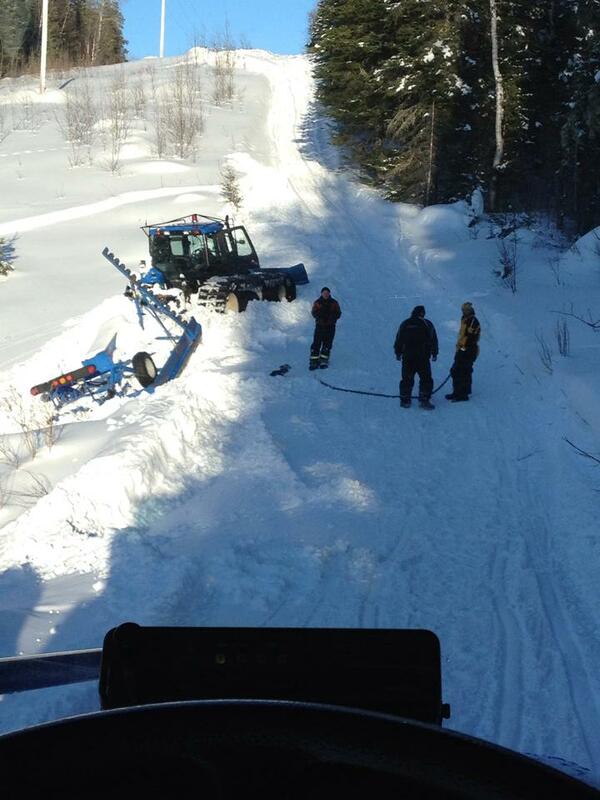 The operator has been trying to get it out on their own and now it’s wedged against two trees with one track off. I guess that’s when they decided to call you for help—once a track came off. The call comes in the middle of the night: “Hey, it’s Todd. I thought trail 102 was ready so I decided to give it a go… turns out there are some wet spots in there. I’m stuck but it’s not bad. It‘ll come right out.” When you get there the groomer is sunken up to the doors in mud and water. 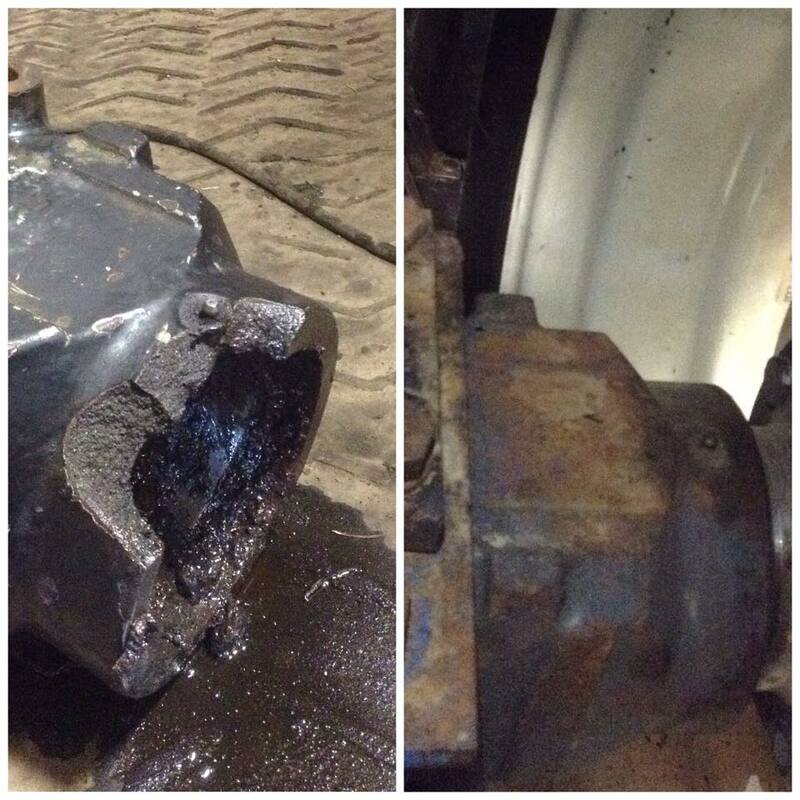 Some SOB is going to have to dive in and hook up a chain to the rear end so it can be pulled it out. It usually takes a full day, an excavator or a big dozer, a pile of people coordinating efforts and asking favours from local contractor friends to help the club out. This is always an exaggerated thing. It’s hard to get a precise answer because there’s always somebody that will beat you. 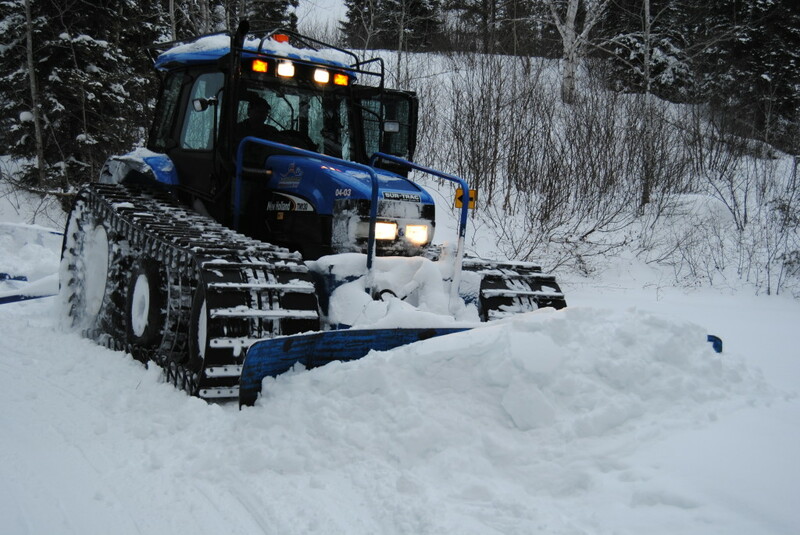 You can have a foot of new snow and the other groomer operator in another club always has more snow than you do… the funny thing is that your trails are always open before and close after that club! How many times something goes wrong and you ask the operator, “Did you check before you left?” and the answer is yes but you damn well know that they didn’t. Did they check the fuel levels, the hydraulic oil level or tighten wheel bolts? Strange that they came loose after a few hours on the trail! I’m one of those guys too. I forgot to check if the chainsaw was in the tool box one time and ended up stuck on a big freakin’ stump about 6 hours north of town. I had to use some redneck ingenuity to get out of that one. I learned the hard way and now I make sure that I have a saw before I leave. How many times have we heard this? 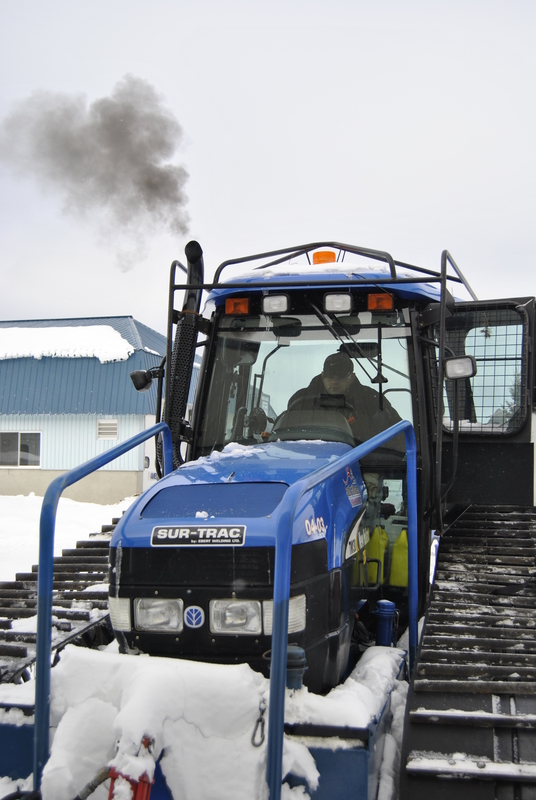 “Our trails are hard to groom and we need this special thing and we can only groom with this kind of groomer that cost 10X times as much the other groomers.” I’ve heard it all! “The hill is steep and there are turns in it so we need this type of groomer.” Couldn’t you just fix the hill, the problem spot or reroute the trail and you wouldn’t need that style of expensive groomer? There are always those debates on how good different groomers are. 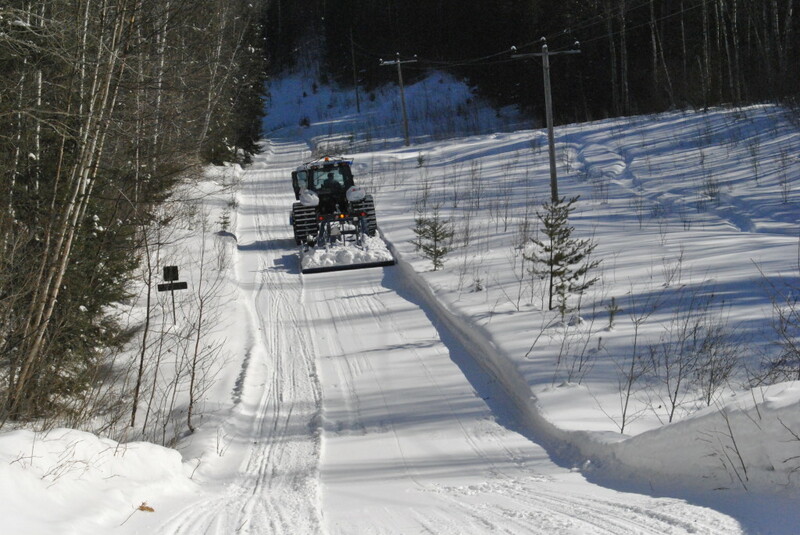 “My groomer can climb hills better,” “Our groomer can groom curves better,” “We have the best drag,” “Our groomer is so good on fuel it can ride for 24hrs on a single tank.” …but they don’t even have a 24hrs long trail and they have 10 jerry cans strapped to the back of the groomer flat deck. What gets me going is people judging styles of machines that they’ve never groomed with. They’ve never used anything other than what their club has, they just assume. They’ve only driven BR’s and think all other groomers are crap. Bent over signs and posts or busted bridge railings that the groomer operator didn’t do but you can clearly see it’s a groomer that took it out and not a snowmobile. What else leaves black marks, is made of rubber and can rip out or snap a 6×6 post like a twig? When you ask who did it nobody seems to know who or how it happened! This is only a short list, there are plenty more of them. 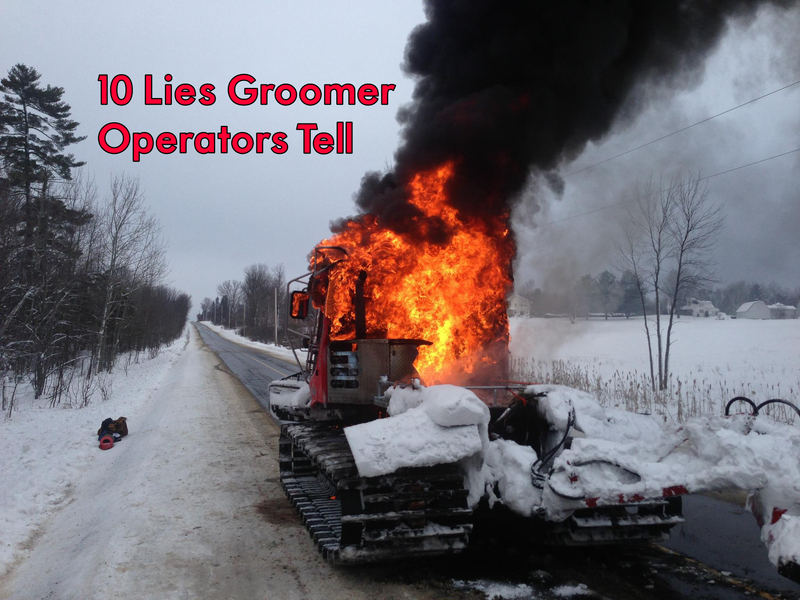 This is in no way a list to blame or to criticize groomer operators—it’s just for fun and I bet we can all relate to most or maybe all of these. As groomer operators we’ve all done something and are probably guilty of a more than one of the examples on this list. 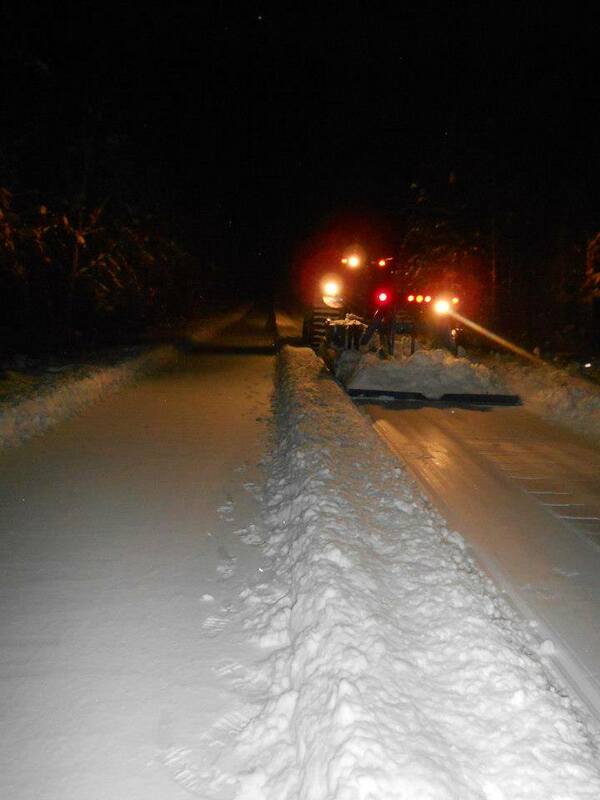 If you’re reading this and you‘ve never done any of these I want to meet you and shake your hand because you are a very special groomer operator, a rare person, an operator like no other, a groomer Sasquatch—or maybe you’re just as bad as the rest of us! Ok this was one big #@%& up I did in my early years of grooming. 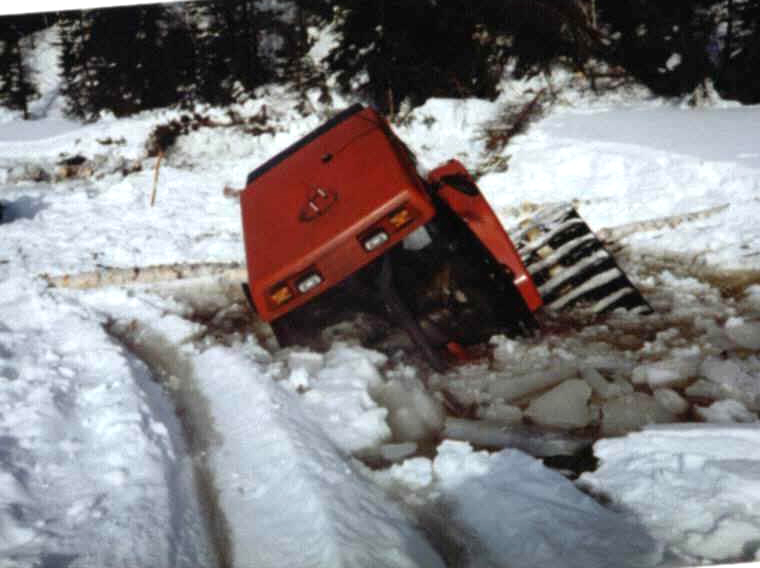 I was told to go grooming the D108A trail north to Hornepayne, a 20-hour run in those days, the late 90’s. I took off early in the morning and was grooming just about 3 or 4 kilometres outside of town when I decided to do some extra work by going over a quick side trail that I wasn’t asked to do. The trail was just a little over one kilometre long. It took you on top of a big hill that had a spectacular view of the town of Dubreuilville and it was starting to be a popular spot with riders. I had un-officially groomed that short trail a few times in the past but it was nothing the club had agreed on and I had never told my Grooming boss I was doing it. The trail was rough with a lot of snow and once you got on top of the hill there wasn’t much room to turn the groomer around, it would take a long time to wiggle back and forth to get it turned around. So on that day I decided to drive further up the hill to find a better spot to turn around. As I drove on with no opportunities emerging I stared getting nervous—I knew I could get in trouble for doing this. 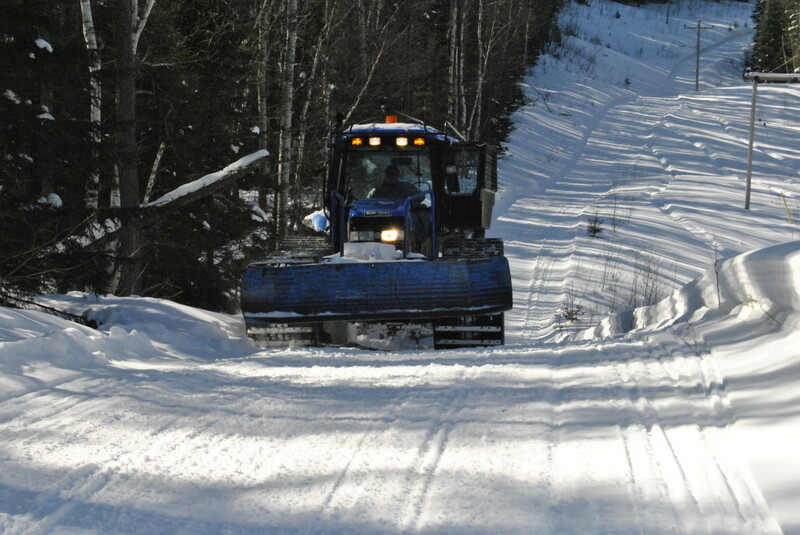 So I got scared and picked a spot to drive the groomer off the old logging road. There was small hump covered with deep snow and my plan was to drive up onto it, back the drag up in the brush and proudly head back on my newly groomed trail. 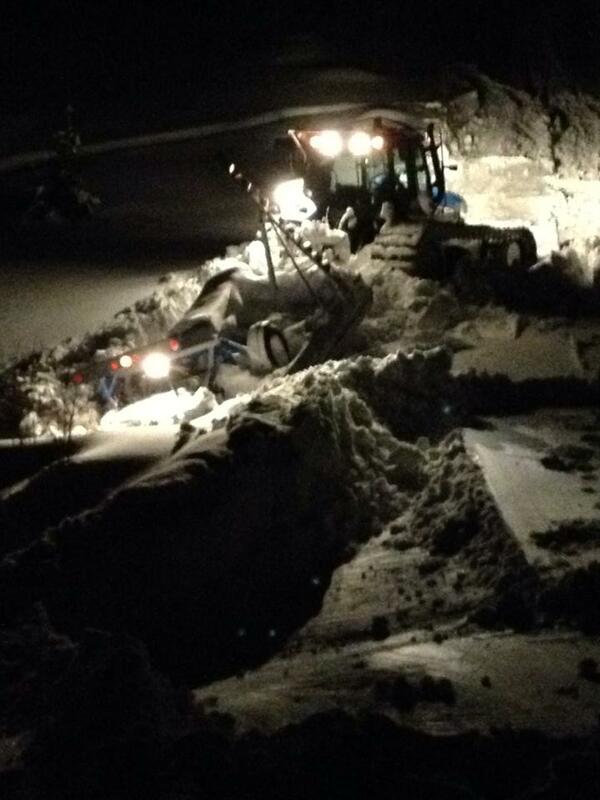 Well, just as I was about to put the groomer in reverse, the front end goes down into that deep snow! I tried backing up but the groomer kept spinning—it was stuck. I got out and saw there was hydraulic oil leaking and then noticed that I had driven over a tall pointy rock that it was wedged under the groomer, preventing it from going forward or backwards. Now I had to call my Groomer boss and tell him the bad news and tell him where I was and that I was not on the trail I was supposed to be on. We had to jack the groomer with a big pile of blocks so that it could ride over the rock and do some on-trail repairs just so it could get back to town. I learned my lesson: I never groomed where I wasn’t supposed to again. If I do feel the need to groom somewhere new I scout it out first to check and see if it’s safe. I know now to never drive into deep snow without the blade down so you don’t hit or drive over something with the groomer and I do not deviate from the intended plan: the trail to be groomed that day. The D108A was not groomed that day and it was my fault… but we did have a nice trail up to the lookout!